The Invisible Hand is a hot-box of a play. It smells of sweat and sand and the metallic tang of adrenaline. 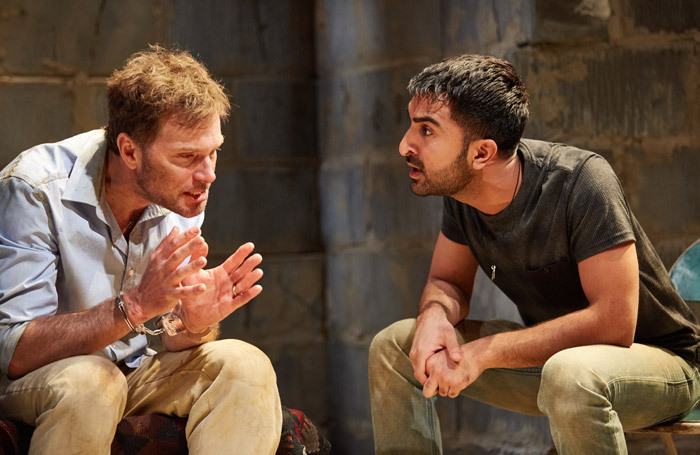 Originally staged in its current two-act form in New York in 2014, the play by Pulitzer-winning writer Ayad Akhtar, is like a mix of The Shawshank Redemption andFrank McGuinness’ Someone Who’ll Watch Over Me with an unexpected dusting of Four Lions-style comedy. American banker Nick is being held hostage in Pakistan by Hounslow-raised Bashir. He’s given the chance to buy his freedom – but only if can raise $10m on the stock markets. The play is one of those well-tooled pieces of writing where you can clearly see all the things that the playwright is doing, the structural mechanics and the political arguments, and yet you still get swept up in things. Indhu Rubasingham’s production – the last before the Tricycle closes for refurbishment – is taut and effective. It blasts the audience with white light. It cranks up the tension. But blunt as it sometimes is, it also humanises all the characters, and is not without humour. The acting is consistently rich, particularly Daniel Lapaine’s performance as Nick, with his mix of arrogance, pragmatism and building despair, while Parth Thakerar is all twitch and sinew as Bashir. The shifting power dynamics between all of the characters are very well-sketched, and it potently conveys the fact that these days wars are being fought online as much as they are in the air and on the ground.